Misunderstandings between you and your cat? Do you have a problem child? Make an appointment for cat behavior modification and training today. Jasper is definitely a cat that is hard to describe. But when you think about it, what cat is easily described. Cats are no different than ordinary human beings. They have emotions; they get depressed, lonely, shy, excited, and even nervous. As I’m writing this he is pacing back and forth on my bed rubbing he cheek on the side of my screen. As comfortable as he is with me now, he hasn’t always been like this. When I first got Jasper he cowered in the back of the cage and wouldn’t come out. He would stare at me with his huge eyes in terror of what I would do to him. I tried to bribe him with food, toys, and I even just sat there and talked to him. However, nothing seemed worked. Then Jenne came along. She gave me step-by-step instructions and told me if I followed them that Jasper would come out of his shell. And each and every day I did what she told me. I kept him in my room with the door closed and he began to feel more and more comfortable with me as the days went by. Eventually he would sleep on the foot of my bed and then after a couple days he was right by my face. I couldn’t have imagined the cat that was too afraid to come out of its cage sleeping next to me during the night. But I loved it and I loved him. He became my best friend and eventually everyone’s in my house. As I write this more and more memories come flooding in of days when I just told jasper about my life and I felt like he truly cared and was there for me. Cats are unusual creatures but once you figure out how they work, they’re the most amazing friends you could have. When my new kitty Maleficent stopped using the litterbox, I didn't know what to do. But Jenne did! We haven't had a problem since! Call her!! Thanks Jenne!! Things have improved enormously!! Pretty much overnight there was a shift in behavior. The scheduled feeding had a huge effect. Cholo is in fact the most excited at feeding time. He's first in line for the bowls. My relationship with him has dramatically changed. I'm giving him lots of love, praise and attention. I tell him he's my king, my Mufasa. He loves it. I know he understands. And I give him treats first and food first I've been playing with him a lot, but he's not always interested. Still, he is a MUCH happier cat. The biting has gone down considerably. He still bites, but very little and he stops right away. I ignore it when it happens. It's almost gone now. What a relief! Giving my cats a break from the kittens has been wonderful. I didn't realize how crazy it was with the kittens, but my cats are so relaxed when they are put up. They love it. They spread out, relax, and enjoy themselves. And I feel more relaxed too! I think I needed a break as well and didn't even realize it! Thank you so much! I was telling someone about our visit and a stranger was listening in. She has her own kitty situation. I'm recommending you to everyone I can! What a miracle you are working in our lives! Jenne is wonderful! She gave us the best advice on our cat. It worked like a charm! She was responsive, gave us extra material to read and learn more, and followed up to see how our cat was doing. I highly recommend her service. She is knowledgeable and caring. Jenne restored peace and order to my chaotic home. We had rescued an injured stray kitten and brought him into our home to join our other two cats. He was a voracious eater and would eat through loaves of bread, bagel packages and seasoning packets and would also bully the other house cats. Jenne arrived at our home and quickly won over even our most timid cat. I had made the appointment for the wild kitten but Jenne spent time getting to know all our cats and learning each ones personality. All my cats benefitted from the lessons Jenne taught us and it was a joy having her in our home. My unruly kitten is a changed "man". Jenne saved the day! When I moved to a new house I had to start keeping my Siamese cat indoors. He absolutely refused to use the litterbox. He went right in front of it, behind it, around it, everywhere except inside it! I had to line my living room with painter’s plastic. He made our lives miserable. The thing is, I knew he wasn’t happy either. Jenne Mundy somehow convinced him that this was not the way to behave. To this day, I still have no clue how she did it! Jenne Mundy has been a tremendous help in assisting me with managing a multiple cat household. I have reached out to her on many occasions and received excellent help in resolving whatever issue I was currently dealing with. 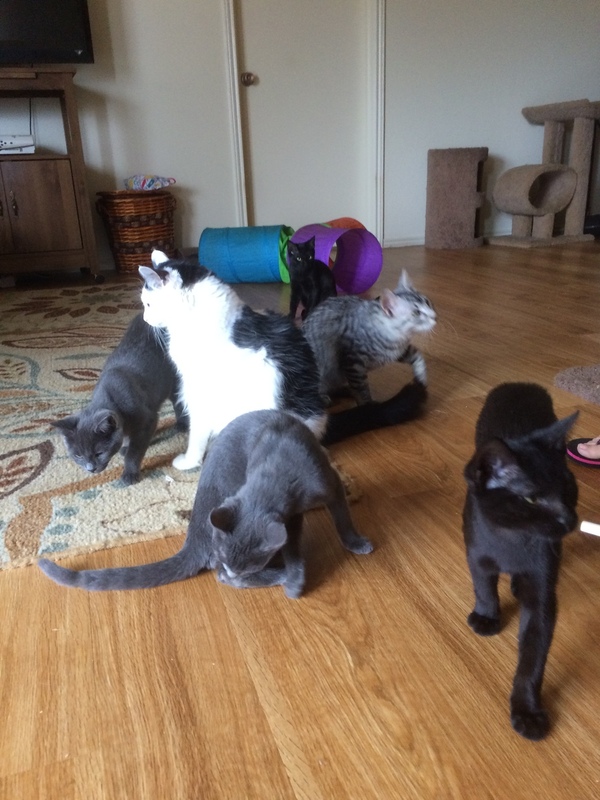 Our household was often challenged with various situations: cat box issues, wound care, predator cats, feeding and caring for a terminal cat, emergency care, and some general behavioral issues (clawing furniture and aggressive behavior). Jenne always addressed me with respect and true concern for my cats and assisting me towards a positive outcome. I contacted her many times because of her great advice and successful outcomes. I would highly recommend her to anyone in need of making your human/cat household a more loving and peaceful one. Jenne Mundy is my hero. She helped me end what I called "Kitty Watch 2011" and "Kitty Watch 2012" when my indoor only cat Sebastian got out. She was there for me every step of the way. In 2011 he was found on night 10 in a feral cat trap that Jenne told me exactly where to set and what bait to use. In 2012 he stayed out for 14 days and avoided all of my feral cat traps, but I was able to see him on night 10 at a Kitty Buffet that Jenne helped me set. She also helped me to make sure there was no Kitty watch 2013, or 14! She’s helped me with so many other kitty behavioral problems, from new kitty introductions to territorial stressing. I cannot say enough times, CALL JENNE, she’ll help you find your lost kitty, and fix your kitty household drama.